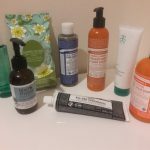 Reviews of truly cruelty-free beauty and personal care products. These are Not Cruelty Free! (Unscented): Saponified organic coconut, olive, and jojoba oils, organic aloe vera, rosemary extract. (Sweet Orange): Saponified organic coconut, olive, and jojoba oils, sweet orange essential oil blend with organic orange oil, organic aloe vera, rosemary extract. (Peppermint Magic): Saponified organic coconut, olive, and jojoba oils, peppermint essential oil blend, organic aloe vera, rosemary extract. 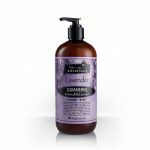 (Lavender): Saponified organic coconut, olive, and jojoba oils, natural lavender essential oil blend, organic lavender oil, organic aloe vera, rosemary extract. All Aloe Castile soaps are free of artificial colors, fragrances, preservatives, animal products, by-products and testing. Pangea also sells Kappus Soaps, Kiss My Face Soaps and Veganu Soaps. 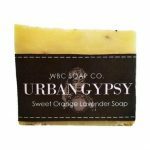 Kappus Soaps are fruit-scented vegetable glycerin soaps.They are available in apple, grapefruit, mandarin orange, strawberry, vanilla, raspberry, peach, coconut and lemon scents. Manufactured in Germany, Kappus Soaps are made with sodium palmate, aqua, sodium cocoate, sorbitol, glycerin, coconut acid, parfum, alpha isomethyl ionone, benzyl alcohol, tetrasodium etidronate, tetrasodium EDTA and sodium chloride. 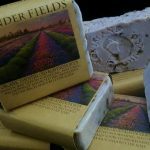 Kiss My Face all-natural cleansing and moisturizing bar soaps do not contain any artificial colors. Made in Greece, the soaps main ingredients are olive oil, aloe and chamomile. Other ingredients include: water, sodium chloride and citric acid (a natural pH balancer). Veganu bar soaps are made from natural plant based ingredients as well as sodium palmate, sodium cocoate, water, glycerin, fragrance (green tea and citrus), sodium chloride (salt) and pentasodium pentetate. Veganu does not use ingredients tested on animals or known to be harmful to the environment or people. Veganu has a green tea and citrus scent. Pangea also sells the first and only sanitizing product made without alcohol or harsh chemicals. Instead of using chemicals such as Triclosan (a potent endocrine disruptor) and Benzalkonium Chloride, Clean Well Hand Sanitizer uses an antibacterial agent called Ingenium. Ingenium is a patented formulation of botanically sourced essential plant oils that kill 99.99% of harmful germs that can make you ill. Ingenium is the only all-natural antimicrobial that meets EPA and FDA standards for germ killing efficacy. Ingenium is extremely effective against MRSA (resistant Staph), E.Coli and Salmonella. Pangea Vegan Beauty Products has been in business since 1995. The company states that it was the first company to offer a comprehensive selection of high-quality, completely cruelty-free vegan products. All Pangea employees follow a vegan lifestyle, and the company is committed to being animal-friendly. In addition, Pangea strives “to maintain the highest ethical standards in every other aspect of (the) business”. The company states that they also “refuse to carry products manufactured under oppressive labor conditions”, and the company re-uses and recycles boxes and other shipping materials for mail orders. In addition to vegan soaps, Pangea sells a wide range of vegan beauty products, as well as vegan products in all categories from A-Z. Pangea sells hard-to-find items as well. 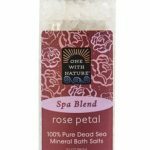 Pangea Vegan Beauty Products is located in Rockville, Maryland. Renpure is a Vegan Drugstore and Department Store Line That Will Cleanse Your Body But Not Clean Out Your Wallet! 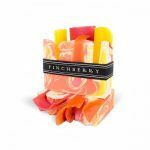 You’ll Love Finchberry Soap Products — They’re Vegan, Colorful and Delightfully Decadent! Get notified whenever a new review is posted! Kirk’s — Your Great-Grandmother Loved This Vegan, All-Natural Product, And You Will Too!